All schools have now been invited to use this service. If you have not received your invitation to sign up please email Teaching Vacancies. Over the last few months we've tested our free national search and listing service for teaching roles in schools in Cambridgeshire, Peterborough and the North East of England. We've made improvements based on feedback and observation and are now ready to roll it out across England in stages. Rolling out the service in stages allows us to further test and refine the service. Schools will be invited to start listing roles on the service according to which Regional School Commissioner (RSC) region they're in (or, in the case of multi-academy trusts, which RSC the majority of their schools fall in). These dates are our best projections but they may change as we learn and test how the new site is performing. We will update them here if they change. Find and zoom on the interactive map. Other sources include listings on third party websites and observations based on regional differences between teacher vacancies from the wider web and other service providers. We also used the theory of viral change to help plan our roll-out of the service. This is the idea that a small number of influential individuals endorsing a behaviour leads to a much larger number of people adopting that behaviour until it becomes the new norm. In our case that behaviour is using the service. Early in development we selected regions where we had valuable influencers, high levels of interest and could expect to generate the critical mass needed for viral change. This, combined with data analysis, helped us grow the service early on. While viral theory and data analysis have been valuable tools, fundamentally we rely on you to help us make real our vision for a national search and listing service for teaching vacancies. So please help us spread the word. And if you hire teachers for a school, make sure to create your account as soon as you receive your invitation so you are ready to list teaching roles. Looks good. Sooner the better that this is rolled out. Can you please add me to the testing. Hi Frances, you can sign up now - we'll email you an invitation! Hello Sam - you should have received an email by now about this. Hello, we are a Hertfordshire based school, are we able to use this service yet? yes, we'll be in touch! Would it be possible for us to be added to the testing phase as well? We are keen to get this up and running to support our schools and our ITT programme. Hi, we are a MAT (Laurus Trust) in Stockport - should we have received an invitation to be on-boarded as yet? Can you please provide an indication of when this will be rolled out in South East London and Kent. I would also like to be added to the distribution list as the HR Lead for our Trust. Would it be possible for our school to be added to the list please? We are very impressed and keen to use the service. We are a pupil referral unit based in Essex. Should we have received an invitation by now? Will this be rolled out to Yorkshire & Humber from 1st December 2018? If so how soon are the invitations sent out and who receives it? Thanks for your interest. Your school(s) can sign up to the Teaching Vacancies service by emailing teaching.vacancies@education.gov.uk and requesting an invitation. We are based in Wendover, Buckinghamshire, when will we be able to use this service? Would it be possible for someone to contact me as we are keen to use this new site but as yet haven't received any login details for any of our academies. Hi, we are in East London, (Plaistow) are we able to use this service? Please can you add us to the testing? Would also like to use service- think maybe should have had an invitation- Central Bedfordshire? Thanks Julie - we'll send you an email. I'm from Wexham School in Slough. Our headteacher has received the invite but can't seem to log in? Sorry to hear you're having problems. We've let our helpdesk know, and they will be in touch. Thanks Lorna - we've emailed you an invitation. Please would it be possible for someone to contact me as we are keen to use this new site but as yet haven't received any login details for our school. Thanks Jo - we'll send you an email. hi please can we be sent an email we are based in South London. Thanks Cheryl - we've emailed you. Hi Ann Marie - we've emailed you an invitation this morning. Can you let me know if you have received a request from Ely College in Cambridgeshire to set up an account as I haven't heard back from you. Thanks for letting us know, Victoria - we'll email you about this. Can you please let me know when this will be rolled out in Warwickshire. I am the recruitment lead for our Trust and would like to be kept informed. Hi Val - thanks for your comment. We've sent you an email. We are a Multi-Academy Trust in Havering and would be very interested in using this resource please, if we are now eligible? Thanks for your message - we've sent you an email. Good morning. We are a school based in East London. According to the interactive map, roll out should have happened. Is East London eligible? I see that North East and South London are. Thanks for your comment Marcia - we'll send you an email. Hi Justin - we need a few more details so we'll get in touch via email. Hi Helen. Thanks for your comment - we've sent you an email. Thanks for your message, Brian. We've sent you an email. have we had our invite to our school? We have changed Head teacher so it may have gone to the old Head's email address. Thanks for your message, Monica - we've sent you an email. I am the HR Manager for a MAT in Southampton and we would love to use this service please if you could send me an email? Thanks Louise, we'll send you an email. We are a MAT in Tunbridge Wells. Has the service gone live in our Region as yet? We at Warwickshire College Group would love to be part of the service. Hi Anna, thanks for your message - we've sent you an email. Hello - We area junior school in Hertfordshire - can we access this service yet? Hi Julie, thanks for getting in touch - we've sent you an email. I am the Head of HR at Finham Park MAT in Coventry. I understand that the service will not be rolled out in our area until Feb 19, however, if you could send me an email I would like to use this service as soon as possible. Hi Laura, thanks for your message. We've sent you an email. We are a Suffolk school. Can we now use this service? Hi Jonathan - thanks for getting in touch. We've sent you an email. Please can we sign up to the advertising platform? Hi Alison, thanks for your comment - we've sent an email. Please could you let me know when this goes live in West Yorkshire - it did say 14th January. Hi Claire, thanks for your message - we've sent you an email. We are based in Bury but do not appear to have received an email yet, please could this be sent to me as I am responsible for recruitment. Thank you. Hi Jane, thanks for your comment - we'll be in touch via email. We are a MAT in the North West. Would we be able to have an invite please to join? Hi Donna, thanks for your message - we've sent you an email. We are a school in Surrey and should have had an e-mail Nov/Dec 2018.
Who did it go to or can you please resend to me to post some vacancies? Thanks for your message, Liz - we've sent you an email. Hi Diane - sorry to hear you're having trouble. We've sent you an email. Hello - thanks for your message. We've sent you an email. We have a local SBM group meeting next week. It would be good to be able to share how to gain access to the service. We are based in Wigan (scheduled for Dec 18 roll out). Hi Daniel - thanks for your comment. We've sent you an email. We are a maintained special school in Sheffield. Would we be able to have an invite to join? Hi Jo - thanks for your message. We've sent you an email. We are an Academy in Leicester, would we be able to get an invite please? Hi Nisha, thanks for your comment. We've sent you an email. We are a Secondary School in Essex, please may we have an invite to join. Thanks for your comment, Sue - we've sent you an email. Please let me know when/if roll-out has happened in Tower Hamlets. We would like to join. Hi Elspeth, thanks for your comment. We'll be in touch via email. This appears to be a brilliant service that promises schools to save ££££'s. We are based in East London, can we be added to the service? Are we also able to use this service to advertise for support staff roles? Thanks Peter - we'll send you an email. Hello, we are St Andrews High School in Worthing and haven't received an invite. When will we be able to join? Thanks for your comment Justine - we've sent you an email. We are a Multi-Academy Trust in Cumbria and would be very interested in using this resource please, if we are now eligible? Can we please register for this service? We're a small MAT based in Lincolnshire. Many thanks. Thanks for your comment Bev, we'll send you an email. Hi We are a Primary School in Southend on Sea and don't appear to have received an invite yet? Thanks for your comment - we'll email you! We'd really like to begin to access this for schools in our Trust. Is it possible to please get access? Thanks Libby, we'll send you an email. Hi - please could you send an invite to Castle Donington College in the East Midlands. Thanks. Hi Jeremy. Thanks for your comment - we'll send you an email. Have the invitations gone out to schools in Surrey? I have not received one yet but it is indicated that roll out for us would be December 2018. Are independent school (whose fees are paid by a LA) able to use the service? If so, please can we be invited to join. Hello Lois - we'll email you shortly. I'm keen to get access to this - please let me know how! Hello Peter - We'll email you. Can you let me know when this service will be available to us in Cheshire East or send an invite to me please. Do we register as a MAT or do all of our academies have to register separately? I'm at a MAT HO based in Birmingham and would love to get us all signed up. 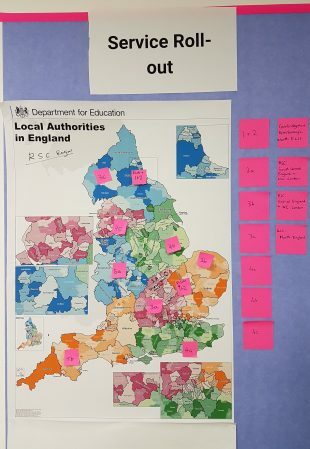 Most of our schools are in areas that have already rolled out I think. Thanks. Hi Nicola - we'll email you shortly. Hello there. Yes we'll email you. Hi, I'm at Gordon's School (Surrey Heath) and we don't remember seeing an invitation from the DfE. Could you re-send it to me as we're keen to start using this service. Thanks. We cannot seem to find our orignial invite to this new site and would love to use this. Could it be resent to our Head's email please. We are Isebrook SEN College based in Northamptonshire. has the service been rolled out to NE Lincolnshire yet please, we would like to use the service. Can I please have an invitation to this service? As the superuser for Secure Access/DfE Sign In, should I be able to assign access right s for this myself? Can I please get an invitation to advertise recruitment. I manage the recruitment for six schools for a MAT in based in Wiltshire. Hello Jo. We've emailed you. We are a school in the East of England - Linton Heights Junior School but don't appear to have received our login. Please can you email this to office@lintonheights.cambs.sch.uk. Hi Sarah. We'll send you an email. I believe Northamptonshire schools have already been invited to use this service, but we don't seem to have the original email. We are Barton Seagrave Primary School. Please can you send the joining instructions to me as we would like to start using it asap. Should I be able to sign in using my Secure Access / DFW sign in? Hello - we'll email you shortly. I have noticed that other schools in my area are able to advertise, but we have still not receive our login details. Can you please let me know what we can expect to receive them. Hello there. We'll send you an email about this. Please could we be provided with a link to share jobs at our school? Hello - we'll email you. We are an academy in Portsmouth. Should we have received an invite? Please can we be sent one? I am based in West Berkshire and believe that invitations have been rolled out. I work as the HR manager and have not received one (it may have gone elsewhere in the organisation, but I can't track it down). Please would you send me an invitation so that I can begin advertising on the site? Hello Eilidh - you should receive an email shortly. Hello Nicola and apologies for any delay. You should receive an email shortly. Just checking whether this service has been rolled out in Kent yet? Hi Tara - we've emailed you. We are two primary schools (Bisley Bluecoat and Oakridge Parochial schools) near Stroud, and we Have just advertised for a new Executive Headteacher. Is there any way to get an account so that we can advertise on this new service? Hello Jon - we've emailed you. Hello, we are Empower Trust, a Multi-Academy Trust. Please could we set up an account asap as I have some pending vacancies that I would like to advertise. Hello We are a school in Southampton, we haven't received our invitation to sign up yet ? I registered a few months ago to join would it be possible to resend the invite please ? Hello Sarah - apologies for the delay. I've forwarded your comment to the team. They'll be in touch shortly. I sent an email to register an account yesterday - I am in the NW - Nothing in return yet. How long will it take? Hello Gary - you should have received an email in the last couple of days. Let us know if not and apologies for any delay. Hello, I am hoping you can help. Please could we request a login for Cotgrave Candleby Lane School. I also wondered if it was possible to have a Multi Academy Trust level access for our central team for vacancies? Hello Nick - we've replied via email. We emailed a while ago and have not received anything, I have just emailed again as we are very keen to advertise vacancies using the service. Hi - we'll email you shortly. Can I please be sent an invitation? Hello - you should receive an email shortly.